Approximately 3500 species of centipedes are found in the class Chilopoda, phylum Arthropoda. They are among the less well-studied arthropods. Centipedes are elongated multisegmented arthropods with a single pair of legs on each body segment. They are distributed widely, being present on every continent except Antarctica, and are especially common in warm temperate and tropical regions. 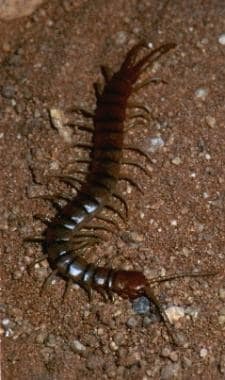 Centipedes spend much of their time underground or in rock piles and usually come out at night to actively hunt their prey. They are capable of very fast movement when exposed. The most dangerous species belong to the genus Scolopendra, with the largest members (Scolopendra gigantea) reaching lengths of 26 cm. See the image below. Giant desert centipede. Photo by Michael Cardwell. The venom delivery apparatus consists of a modified pair of front legs (ie, forcipules) just behind the mandibles. Venom is produced in a gland, generally located at the base of each forcipule, and is injected through ducts when the forcipules are driven into the victim's tissues. Centipede venoms have not been studied as extensively as many spider and scorpion venoms, but they do contain a wide array of components, including 5-hydroxytryptamine (serotonin), histamine, metalloproteases, hyaluronidase, pore-forming toxins, CAP proteins, and ion channel modulators. [1, 2] In addition, some centipede venoms may cause endogenous release of histamine. In addition to venom, some species exude defensive substances from glands found along the body segments. These secretions are usually nontoxic to humans, although at least one species of the genus Otostigmus secretes a vesicating substance. Prognosis is excellent in the vast majority of cases of centipede envenomation. Most species are relatively innocuous. Fatalities are extremely rare following centipede stings. A death was reported in a 7-year-old Filipino girl who was stung on the head by a centipede of the large species Scolopendra subspinipes, which may reach 23 cm in length. A case of electrocardiographic (ECG) changes suggestive of ischemia has been reported in a 60-year-old man after a sting by a 12-cm centipede in Turkey. While there was a slight associated elevation in serum CK-MB and myoglobin, troponin I, troponin T, and delayed exercise stress testing were all normal, and the ECG returned to normal a few hours later. Another 20-year-old man in Turkey presented to an ED with chest pain approximately 24 hours after a reported centipede sting. His ECG revealed inferior ST-segment elevation, and he had a positive rise in his CK-MB and troponin T levels. His echocardiogram was normal, and he did well after conservative therapy (without thrombolysis or angioplasty). Delayed coronary angiography revealed normal coronary arteries. The patient was noted to be "completely symptom free" at 17 months. He was felt to have suffered a myocardial infarction, possibly related to coronary vasospasm, inflammatory changes, or multifactorial effects. A 22-year-old man without cardiac risk factors suffered an apparent ST elevation myocardial infarction following a purported centipede sting in India. The victim was stung on the finger, had immediate pain and swelling, and, 2 hours later, developed chest pain with nausea, vomiting, and diaphoresis. On presentation to the hospital 14 hours after the injury, his ECG was consistent with anterior ST elevation myocardial infarction. He was treated with nitrates and morphine. His creatine kinase MB level was elevated and his troponin-I was 13.2 µg/L. Echocardiography revealed anterior wall hypokinesis. Cardiac catheterization revealed normal coronary arteries. Three days later, his ECG and echocardiography returned to normal. A 31-year-old man in Turkey was stung on the foot by a 10-12 cm golden-colored centipede. He presented to an emergency department approximately 1 hour after the sting, complaining of foot pain and swelling. Shortly after arrival, he developed squeezing chest pain radiating to his left arm. While an electrocardiogram (ECG) was being obtained, he went into cardiac arrest. He was successfully resuscitated within 5 minutes and was treated with aspirin, heparin, and intravenous nitroglycerin. His ECG demonstrated inferior-posterior acute myocardial infarction, and an echocardiogram revealed akinesis in the inferior and posterior segments of his left ventricle, as well as hypokinesis of the lateral wall. As he continued to have chest pain and ST elevations despite conservative treatment, the decision was made to administer 100 mg of tissue plasminogen activator (t-PA). After 90 minutes, the patient’s symptoms resolved and his ECG normalized. His troponin I peaked at 7.23 ng/mL at 12 hours. He was transferred to a facility capable of performing a cardiac catheterization, which revealed normal coronaries. Follow-up echocardiogram demonstrated only slight hypokinesis of the inferior wall of the left ventricle and an ejection fraction of 65%. His only cardiac risk factor was a smoking history. The authors of this report suspect his myocardial infarction and arrest were due to venom-induced coronary vasospasm leading to an acute coronary thrombosis. A case of rhabdomyolysis complicated by compartment syndrome and acute renal failure requiring temporary hemodialysis has been reported following the sting of the giant desert centipede, Scolopendra heros. Prolonged, isolated proteinuria without any other evidence of renal dysfunction has also been reported in a young female following Scolopendra sting. Langley reported 5 centipede-related deaths recorded in the National Center for Health Statistics  CDC Wonder database in the United States between 1991 and 2001, though he had no supporting documentation to confirm that these deaths were truly due to centipedes. Undheim EA, Fry BG, King GF. Centipede venom: recent discoveries and current state of knowledge. Toxins (Basel). 2015 Feb 25. 7 (3):679-704. [Medline]. Undheim EA, King GF. On the venom system of centipedes (Chilopoda), a neglected group of venomous animals. Toxicon. 2011 Mar 15. 57 (4):512-24. [Medline]. Medeiros CR, Susaki TT, Knysak I, et al. Epidemiologic and clinical survey of victims of centipede stings admitted to Hospital Vital Brazil (São Paulo, Brazil). Toxicon. 2008 Oct. 52(5):606-10. [Medline]. [Full Text]. Ozsarac M, Karcioglu O, Ayrik C, et al. Acute coronary ischemia following centipede envenomation: case report and review of the literature. Wilderness Environ Med. 2004. 15(2):109-12. [Medline]. Yildiz A, Biceroglu S, Yakut N, et al. Acute myocardial infarction in a young man caused by centipede sting. Emerg Med J. 2006 Apr. 23(4):e30. [Medline]. Senthilkumaran S, Meenakshisundaram R, Michaels AD, Suresh P, Thirumalaikolundusubramanian P. Acute ST-segment elevation myocardial infarction from a centipede bite. J Cardiovasc Dis Res. 2011 Oct. 2(4):244-6. [Medline]. Üreyen ÇM, Arslan Ş, Baş CY. Cardiovascular collapse after myocardial infarction due to centipede bite. Wien Klin Wochenschr. 2015 Jul. 127 (13-14):577-9. [Medline]. Logan JL, Ogden DA. Rhabdomyolysis and acute renal failure following the bite of the giant desert centipede Scolopendra heros. West J Med. 1985 Apr. 142(4):549-50. [Medline]. Langley RL. Animal-related fatalities in the United States-an update. Wilderness Environ Med. 2005. 16(2):67-74. [Medline]. [Full Text]. Veraldi S, Cuka E, Gaiani F. Scolopendra bites: a report of two cases and review of the literature. Int J Dermatol. 2014 Jul. 53 (7):869-72. [Medline]. Hasan S, Hassan K. Proteinuria associated with centipede bite. Pediatr Nephrol. 2005 Apr. 20(4):550-1. [Medline]. Chaou CH, Chen CK, Chen JC, Chiu TF, Lin CC. Comparisons of ice packs, hot water immersion, and analgesia injection for the treatment of centipede envenomations in Taiwan. Clin Toxicol (Phila). 2009 Aug. 47(7):659-62. [Medline]. Bush SP, King BO, Norris RL, Stockwell SA. Centipede envenomation. Wilderness Environ Med. 2001. 12(2):93-9. [Medline]. Hare T. Poisonous Dwellers of the Desert. Southwest Parks & Monuments Association; 1995. 1-32. Peters S. A Colour Atlas of Arthropods in Clinical Medicine. Wolfe Pub Ltd; 1992. 1-304. Tobias JD, Green TP, Coté CJ, Section on Anesthesiology and Pain Medicine, Committee on Drug. Codeine: Time to Say "No". Pediatrics. 2016 Oct. 138 (4):[Medline]. [Full Text].